The best version of a green monster smoothie! 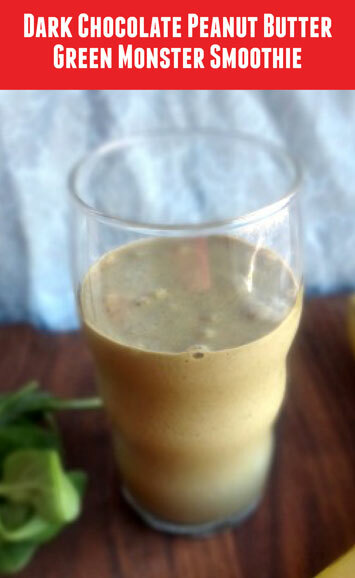 It tastes like a creamy and smooth chocolate peanut butter and banana smoothie with an extra special, extra nutritious surprise — a full cup of spinach! It’s the perfect way to trick yourself, or your loved ones, into getting a healthy and delicious treat. It tastes like it should be bad for you, but it is oh so good! *I advise cutting a banana into pieces before freezing — 1 medium-large banana is about 10 pieces. Place all ingredients into a blender. Cover with the lid and blend until all the ingredients are smoothly and completely incorporated. Pour into a glass and enjoy immediately! The post Dark Chocolate Peanut Butter Green Monster Smoothie appeared first on - Peanut Butter & Co. Recipe Blog.